and Sergey Karjakin(Russia) are in the lead.Vishy started off with a flyer by winning against Topalov in the first round. In the second round, Nakamura lost to Karjakin and then Topalov allowed Aronian to join the leaders after the third round as he was not able to cope with excellent opening preparation by the Armenian. Beforehand, more or less anyone could win the Candidates' Tournament but today it looks like we are down to seven potential winners. It might be somewhat early to say so, but Veselin Topalov does seem to lack the form to emerge victoriously at the end of this month.Perhaps he is simply not too comfortable being in Russia. Ever since #Toiletgate, the scandal during his 2006 world championship match with Vladimir Kramnik, the relation between the Danailov/Topalov camp and the Russian chess scene has been tense. 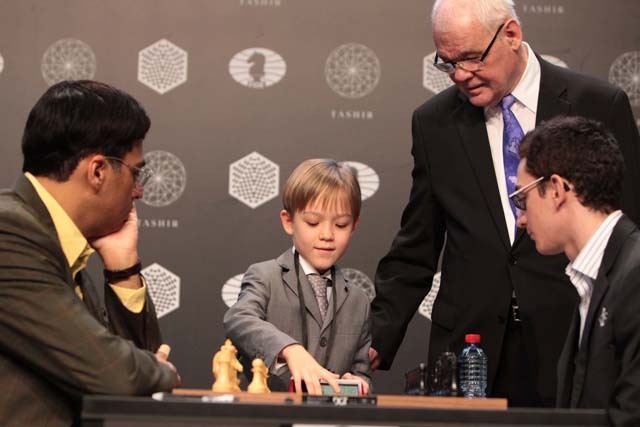 The first move was made by the Russian U9 Champion on the 14th. "I think it will be one of the three: Fabiano Caruana, Levon Aronian and Sergey Karjakin - that’s what I would say. Everything else is pure guesswork." Magnus Carlsen,the current World Champion on who would be his challenger. It was certainly a curious match in terms of openings choices, with neither player opting for their pet Sicilians... until the last match. In a do or die situation, Mariya Muzychuk knew that a symmetrical opening held little hope, and chose the Classical Sicilian. After a lengthy and fascinating battle on both wings, Hou Yifan emerged victorious and is the new World Champion. Hou Yifan undergoing a metal detector test before the final game. After a hectic sprint in the final round, several players were content to secure their places in the standings, while others fought for more. Among the latter was top-seed GM Boris Gelfand, whose tie for first place with GM Evgeny Najer depended on a last-round win, which he pulled off, and a bit of luck. In third was Polish GM Bartel Mateusz. The 6th HDBank Cup 2016 took place from 8-13th March in Vietnam.The event was a 9-round Swiss open tournament with an average Elo rating of 2350. Chinese player GM Wang Hao emerged a solo winner in competition of 71 players from 12 different countries. He scored 8/9 points and played at Elo performance of 2889 to lift the trophy. WIth Wang Hao in Al-Ain Classic in December 2015,which he won with a round to spare.I never miss a chance of getting clicked with champions! The 31st Reykjavik Open is underway in the Icelandic capital.With more than 230 participants and many top grandmasters ,it boasts of a strong field. The Harpa Hall, where the tournament is played, is another attraction. After eight of ten rounds GM Abhijeet Gupta of India is leading with 7/8.Half a point behind follow GM Nils Grandelius and GM Mamedyarov Shakhriyar. Both the Indian players,Abhijeet Gupta and Tania Sachdev, are showcasing great skills with some extraordinary play.With a score of 6/8, IM Tania Sachdev should be hoping to make it to the top-10. 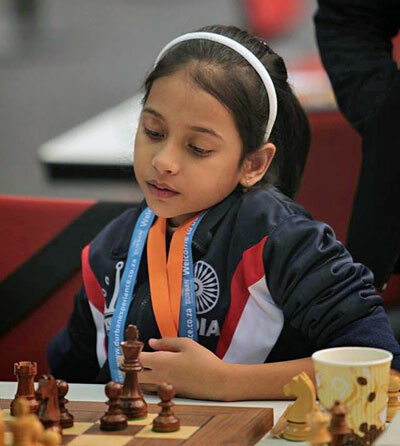 At a tender age of 11,this girl from Maharashtra already has many International medals to her credit (including the World U-10 Championship title).In the 8th Chennai Open Grandmaster Tournament,she defeated many senior players with her magnificent play and gained a whopping 130 Elo Points. Like other Indian young prodigies,she too is going to be an attention grabber in the coming years. I have seen her rejecting draw offers even in dead draw positions! Wooww! !Font looks great now....and nice pic with wang hao.... :) Gr8 improvement...keep it up..